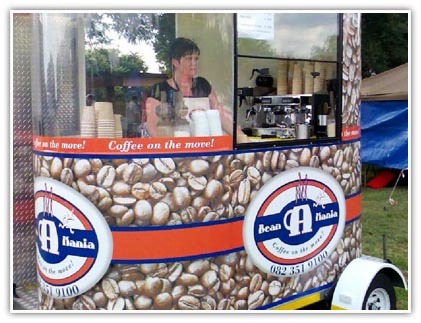 Bean-A-Mania, brings superior coffee to your specific function or event. We at Bean-A-Mania would like to take this opportunity to introduce ourselves to you and to tell you more about how we believe we can further complement your specific function or event. Bean-A-Mania is coffee on the move and specialises in providing espresso based coffee at sport and leisure functions and events. We are a team of coffee professionals who are passionate about what we do, keeping up with the latest developments in coffee varieties, trends, and preparation; determined to treat consumers to superior coffee and excellent service. We at Bean-A-Mania believe we can add a new dimension of professionalism to your next function or event by showing your consumers that you consider them as important by offering them superior coffee to suit their individualised tastes. We know that through maintaining our reputation of ensured consistency we can at the same time enhance your credibility by supplying your customers with excellent service and outstanding coffee. We have been involved in events such as road running, cycle rides, antiques fairs, rugby festivals, school sports days, car shows, and many more. A selection of delectable coffees: lattes, cappuccinos, espressos etc. Thus we urge you to use our services and add positively to the next event that you will be hosting. We can consider a portion of our sales as a donation to your organisation or we can negotiate a fixed rate for the duration of the event. We hope to hear from you with regards to this. For more information please contact Cindy Langford on 082 351 9100 or events@beanamania.co.za.